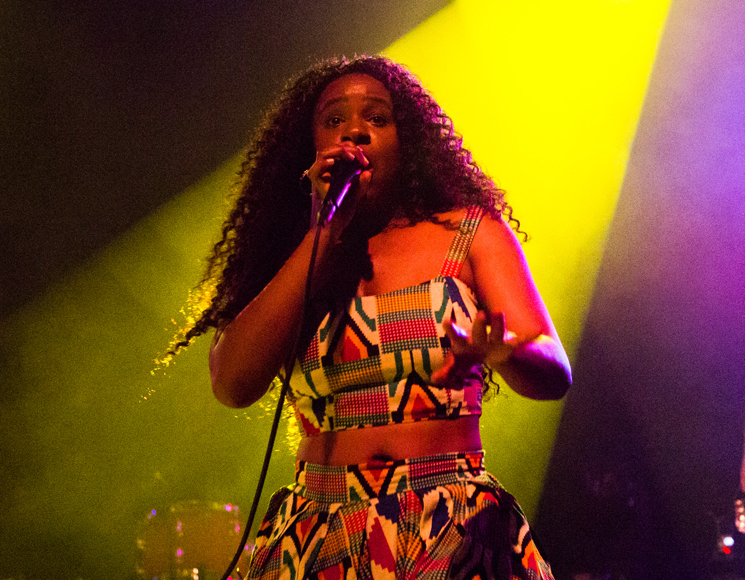 Even after various collaborations with Jai & AK Paul, and two flawless EPs, NAO's popularity in North America came as a bit of shock to her when she began her set for a packed Mod Club. "We came all the way from the UK. It's so good to come and see people singing every word to our songs," she said, genuinely perplexed by the roaring ovation she received in the early going. The UK newcomer played some new songs she said would be on her forthcoming album, most of which channelled 2000s R&B hooks with sultry bass lines and airy, grooved-out electronics. A flashing light show left her gorgeous silhouette immersed in mystery, making her incredible dance moves a cinematic spectacle the crowd ate up as they moved along with her. NAO revealed "Girlfriend," another new song; its alluring downtempo echoed early James Blake, packed with climatic cymbal crashes and guitar solos by her live band. When the syrupy synth swells of "Apple Cherry" kicked in, the crowd went insane and began swaying to the beat. Huge lights adorned NAO as she delivered each delicious lyric with intensity, which got the crowd even more riled up. After playing her last song, NAO said she'd return for an encore depending on how loud the crowd screamed. The crowd stomped and chanted for NAO, who returned to deliver another thumping R&B track, giving hair flips and choreography for days before thanking the crowd one last time.